1- If a producer manages his inventory in the food assembly, because he is already working with a food assembly, if he wants to start selling through a hub on the OFN he has to fill in again all his data. And each week he has to update his product catalog in each platform. He also needs to decide the stock he allocates to each platform. 2- Another problem I have faced trying to build a food hub in Paris: in my hub we wanted to buy vegetables from a group of producer, so display those vegetables in our OFN shop. BUT this groups of producer is already organized and uses a tool for their clients to order online their products. They have a very agile update process, they add products everyday, and as people order online, the stock evolves also dynamically. As a consequence, I couldn’t use the OFN as it was just not possible to synchronize the data on the producers platforms and on the OFN shop. 3- The biggest problem of food hubs is logistics. Most of the time every food hub organizes its own logistics on his side, with big economic and environmental cost (CO2 emission due to transport). Some studies shows that food hubs sometimes are worse than centralized food supply in terms of environmental impact because of that. A producer can choose to manage its catalog and inventory in the OFN for example, and decide to open up its data to another platform if he wants to start working with a food hub using another platform. He remains the owner of his data and control them. For example, in an OFN shop I could have products listed that comes from the OFN database and products that are “hosted” on the Food Assembly database. When an order is made, it impacts directly the stock level in the database of the Food Assembly. So this means read/write authorizations. 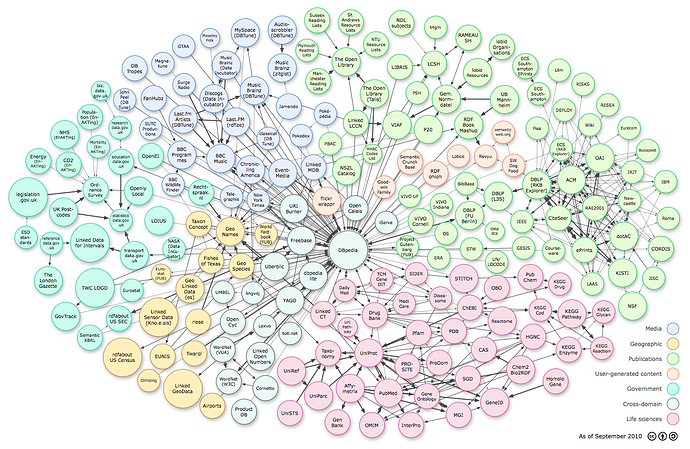 and taxonomies, and on that, the idea is to build an open source thesorus, linked data platform, that all food platforms can refer to when filling in products, etc. Now imagine that products are displayed in standardized way, we can know at any moment what are the products that needs to be moved, from where to where and when, and that for all platforms. I’ll let you know about the next steps, we will try to raise funds and make a website in the coming weeks, to start with! @pmackay and @lin_d_hop do you think this is something that Jack Townsend would be interested in helping with? The RealTimeFarms.com unfortenatly dissapeared. Have anybody some info Why? we have big task in front of us if we go down this road. Resistance of present system may be big but results will be GREATR! Therefore I suggest we try to make it financially better. This means cheaper and light weight. But heavy in planning before execution. I am trying to get my head around this vision - and your description is great @MyriamBoure . In March I am presenting about OFN at a network assembly called Local Organic Food Cooperatives - this is a very quickly growing network of cooperative food hubs in Ontario (and moving across Canada). Right now, some of these cooperatives use open food source software (which originated as the Oklahoma software) which is open source. Others use a variety of proprietary platforms. At this meeting the group would like to discuss how (if?) we can achieve interoperability of different software platforms. There is a growing interest in food hubs trading with food hubs and thus across platforms. As a non-technical person, I can participate in the process of building shared vision - but I am worried that I may help them imagine a future that is not possible from a technical point of view - and then collectively we spend energy on something that isn’t technically likely. How far are you along with this process in France? Anything you can share that might help me spark a vision but - a vision that is achievable in, for example, 2 years? Hi @tschumilas! The project is going super well in France, we are just starting but I’ll share soon an English version of the Data Food Consortium website I prefer to start small with our local folks to find the first bit on how all that could work, but we know that this discussion needs to be held at an international level, probably under the W3C patronage, and I’m meeting next week with a global non-profit working on standardization. 3- We need to be able to share data: through the API, that comply with the standard collectively defined, the data of a producer can be displayed for example in another application. 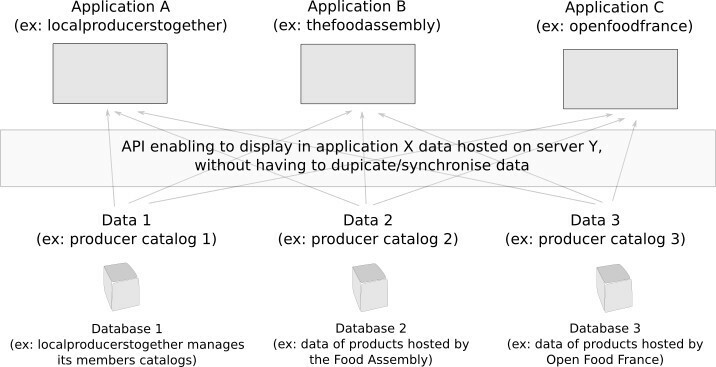 Another big issues is not only about displaying the data from one database in another application, it’s also managing the transactions information: if the data information are in The Food Assembly database, how the OFN hub manager gets the infos in the reports ? How the producer receives the order and can manage and follow it up? Does it receive the order in his “Food Assembly” back end? That would be unlikely that The Food Assembly accept that (just an example) So lot’s of questions are not yet answered, we are only starting the reflexion, we had our first meeting all together in January, and next in 2 weeks. We will go agile, so we’ll first work on a super small prototype between two platforms so that we can study the impact and find solutions step by step, in order to learn! But I have received lots of demands from international activists working on those topics, so I’ll discuss it soon with the group and see how we can open up the reflexion and at least, share step by step what we are doing so that when we open up a more general process all those interested can jump in. @MyriamBoure I think you posted a link to your new website somewhere else recently, could you repost here please? Would be great to see a Github repo where some more detailed discussions could take place. The link to the GitHub repo is at the bottom of the page, @Arthur did the website and repo and… Not sure if we will document first on GitHub, we will do as soon as we start working on the first prototype / use case which will happen in the coming month (next meeting is on use cases, next is on defining objects, etc.) But I’ll explain and document everything in the blog, so we’ll probably have both in parallel. We have just talked about all that with @klinked also who works on those topics and is interested in bootstrapping a Belgium public infrastructure and community. Kalin please feel free to open a thread to share about your experience on that on Linked Farm and the connexion you see with the Open Food Network. Why interconnection is so important?? I have read your threads and the web of Data Food C itself, and you point out many reasons why the interoperability would help the whole system. I would like to work developing interconnections. For sure the fact that each producer or supplier is spending a lot of his efforts trying to sell is because of we are not ¨ well connected ¨ and each one is trying to survive… ( guessing what the customers need and after conquering them…). Please take a look to this thread and if it make sense let us talk please. Best regards and very exiting to go forward working with you. Thank you to re-open the topic of data interoperability. In my eyes it is very important… and one of the reasons why I lost my enthusiasm in OFN. I work now on a local information system for Slovenia and one for our Municipality. And don’t think of using the OFN technology on either project. One of the reasons is information presentation limitation and another is the Rails maintenance programmer costs we cannot ever cover. And I am not sure if I can take part in OFN with my project at a later stage too. Would you meet 2 or 3 times to work on the right questions to decide if we continue or abort it…?? Yes, I do believe a lot in “distributed big data”, we all have data, and we decide to share them in a speific context for a specific purpose we decide. That’s what we are trying to build with DFC. Some data might be published as open data, maybe with some anonymization (like logistics information for instance, all actors want to find mutualized / cheaper / more efficient logistics solution so they all agree to share these data as open data) and some might be shared as “commons data” in a less open context but to achieve some common goal, like sales information might be shared by all platforms to build together reliable statistics for instance that serve the whol ecosystem development. @MyriamBoure - any chance of a project update here when you have some time? I was just looking for a link to send someone about the thinking / direction we’re taking here but I think is all hidden in slack discussions etc?